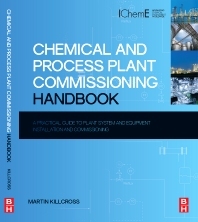 The Chemical and Process Plant Commissioning Handbook, winner of the 2012 Basil Brennan Medal from the Institution of Chemical Engineers, is a guide to converting a newly constructed plant or equipment into a fully integrated and operational process unit. Good commissioning is based on a disciplined, systematic and proven methodology and approach that achieve results in the safest, most efficient, cost effective and timely manner. The book is supported by detailed, proven and effective commission templates, plus extensive commissioning scenarios that enable the reader to learn the context of good commissioning practice from an experienced commissioning manager. It focuses on the critical safety assessment and inspection regimes necessary to ensure that new plants are compliant with OSHA and environmental requirements. Martin Killcross has brought together the theory of textbooks and technical information obtained from sales literature, in order to provide engineers with what they need to know before initiating talks with vendors regarding equipment selection. As we are still in the preparation phase of our plant construction and start-up, I found this book to be very useful, presenting a comprehensive approach to commissioning with real life experience and examples.